The Time Bum has been eyeing Prometheus Watches for some time now. 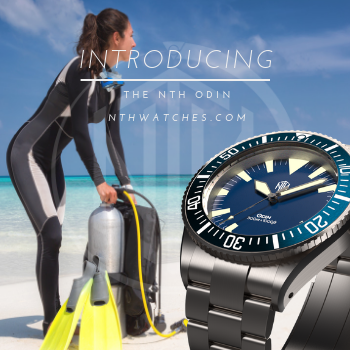 This Portuguese micro brand has been producing quality watches since 2008, including a string of hi-spec, automatic dive watches with bold, clean designs. 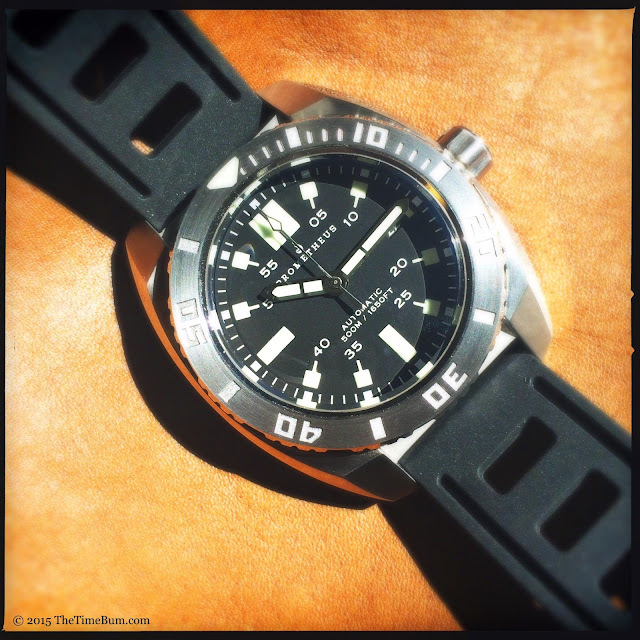 They also happen to be quite affordable, like the 339€ black dial Piranha provided for this review. 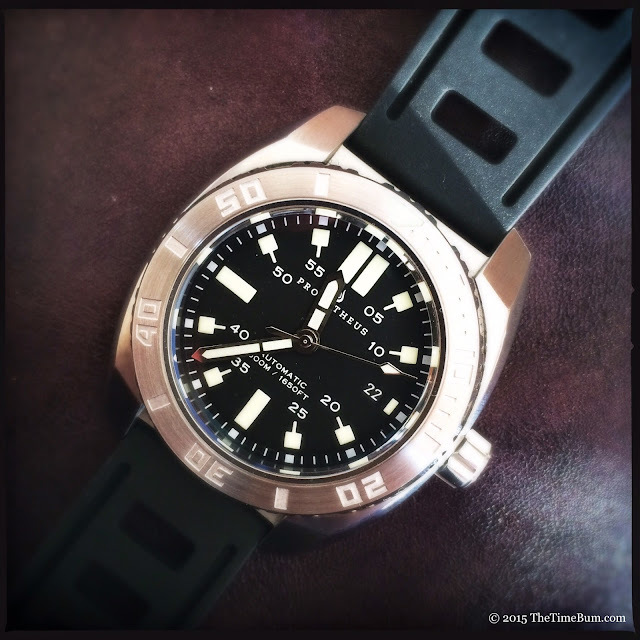 The Pirahna may have been inspired by 1970s dive watch designs, but it is clearly a contemporary piece. The case is by no means small, measuring 44mm wide, 52mm long, and 14.2mm thick. These dimensions push the physical limits of my smallish wrist, but numbers can only give a rough idea of how a watch might appear in person. 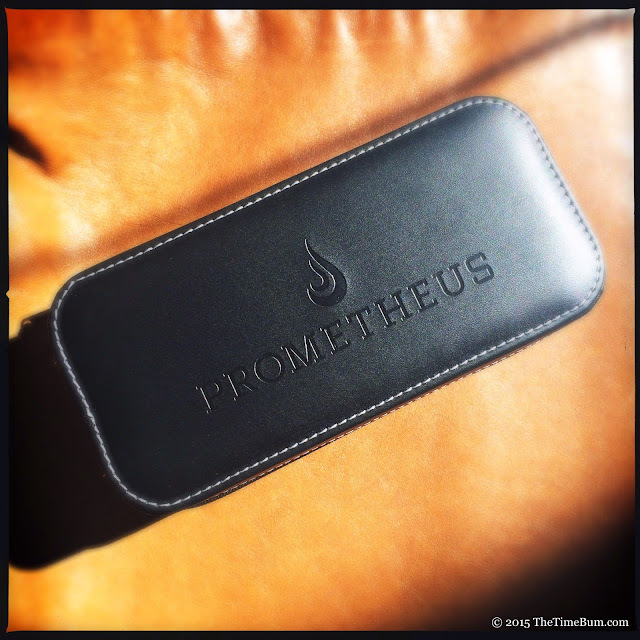 The way a watch actually appears on your wrist is all in the details, and the Prometheus gets them right. The case is barrel-shaped and slightly curved in profile. 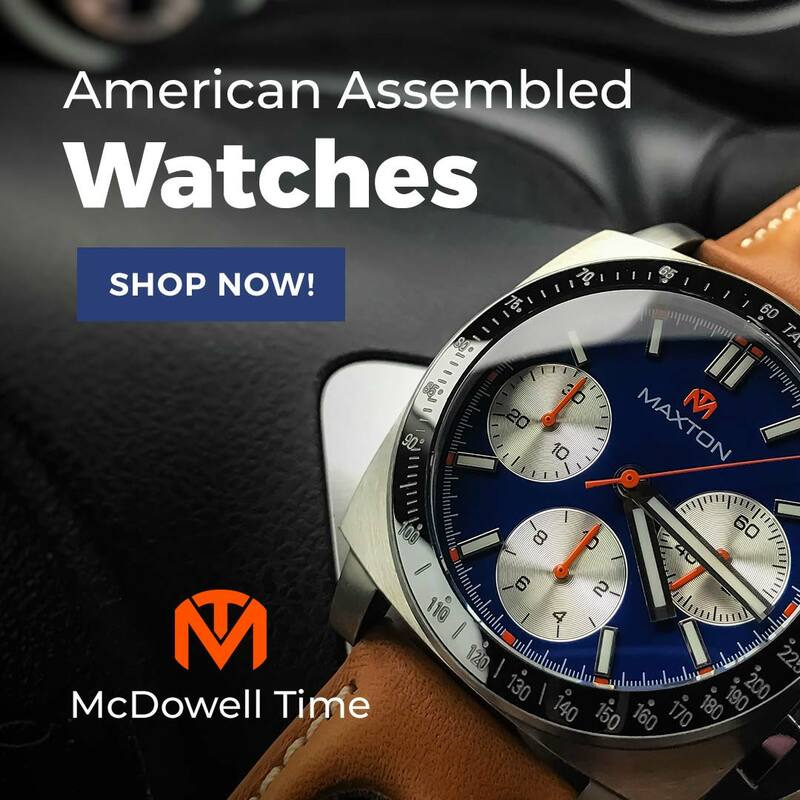 It is dominated by sharp angles that cut along its length and drop sharply to stout, flat end lugs that drop below the case back to wrap around the wearer's wrist. The case sides are tall, shrouding half the height of the bezel, which is brushed steel with white markers and wide, polished grips. The center is lower between the lugs and forms a straight line The case sides are tall, shrouding half the height of the bezel, which is brushed steel with white markers and wide, polished grips. 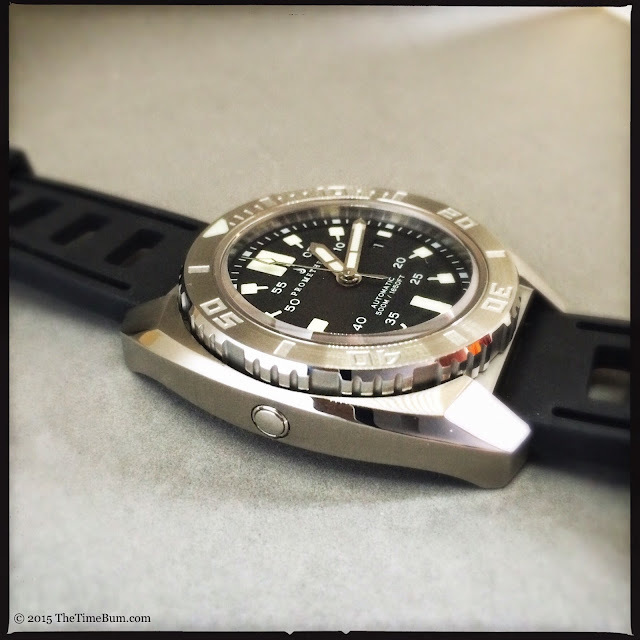 The center is lower and forms a straight line between the lugs, fully exposing the bezel. 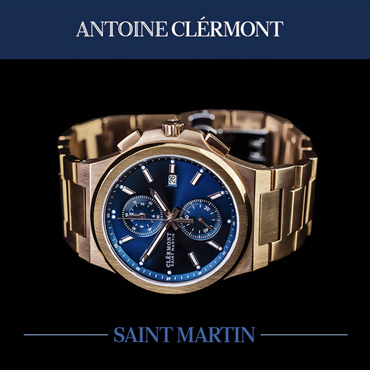 A polished, beveled edge runs the length of the watch providing a welcome bit of flash. The varying reflections off of all these different planes give the Piranha marvelous complexity without being fussy or overbearing. Around back, you are greeted by a cartoon drawing of the watch's toothy namesake. Behind this is the ubiquitous Miyota 9015, a solid choice with its 24 jewels, 42-hour power reserve, hacking and hand winding capabilities, and, of course, the smooth 28.8k bph sweep. 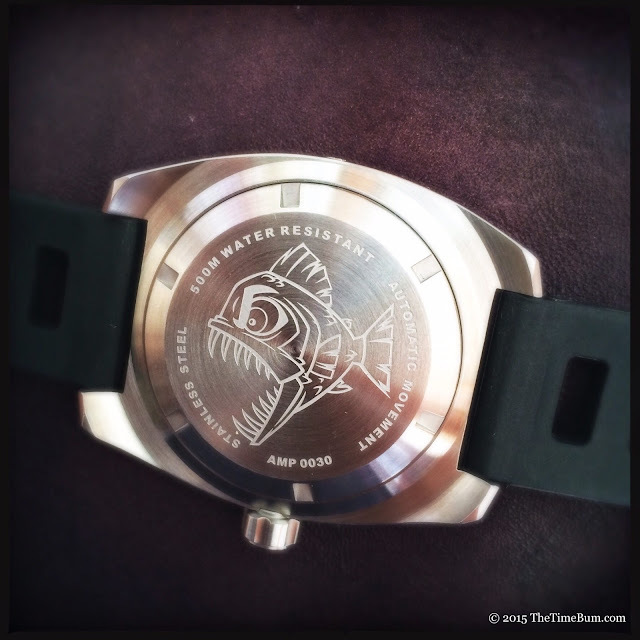 The dial is available in white, yellow, orange, or the black version pictured here. 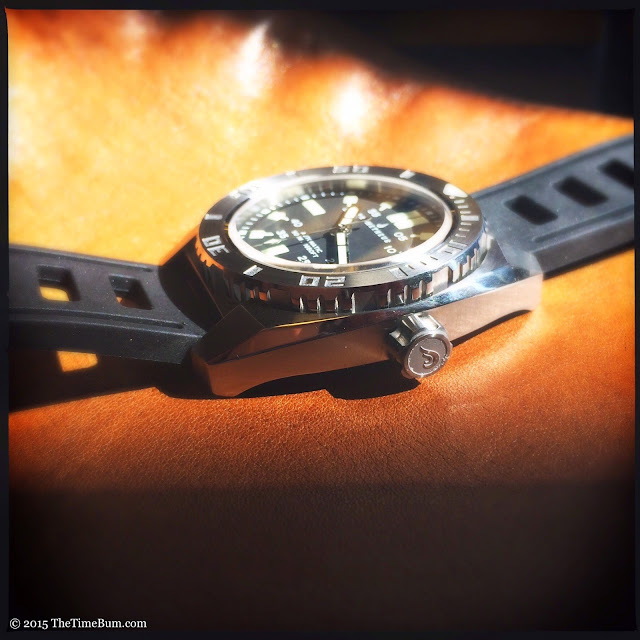 Like the case, the dial deftly carries a great deal of detail. A printed white index surrounds the outer edge. The bar-shaped hour markers dominate at 12, 6, and 9 dial are supported by square markers with pointers to the two-digit minute/second numbers ringing the inner section of the dial. With all of this activity, there is little room left for text. The Prometheus brand and logo are up top, balanced by "Automatic 500 M / 1650 FT" below. It is almost too much, but not quite. I don't think it detracts from the appearance or affects readability, but I might have preferred a bit more breathing room at the center of the dial. The hands are pencil shaped and the second hand is tipped with an arrowhead. 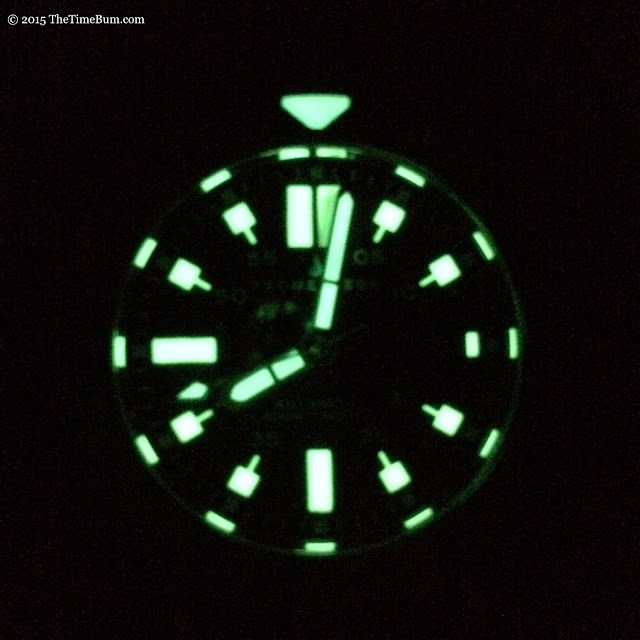 All are polished and lume filled. The date window at 3 o'clock is white-on-black on this black dial, black-on-white on the white dial. This may seem like a little thing, but I love color coordination, and I know it takes some effort to get more than the standard date wheels in these movements, so I appreciate t all the more. 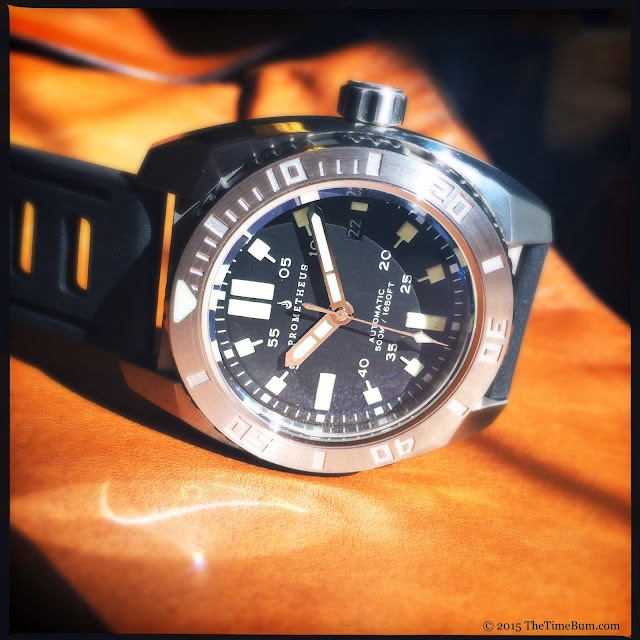 One expects a 500 meter watch to be fully dive capable and the Prometheus is up to the task. The sapphire crystal has an inner anti-reflective coating. Daylight legibility is excellent and eight layers of C3 SuperLuminova grace the markers, hands, and bezel pip, bursting with a bright green glow when the lights go down. Action on the unidirectional bezel is outstanding, moving firmly and smoothly, snapping into each of its 60 detents with a positive click and not a trace of play. The screw down crown is large and deeply sculpted for easy operation with wet hands or gloves. It is also signed with cast image of the Prometheus flame logo, which may not aid you underwater, but looks very cool everywhere else. A helium release valve is the icing on the cake. The real piranha may be a shallow water fish, but the Prometheus Piranha can go deeper than most of its owners will ever dare. 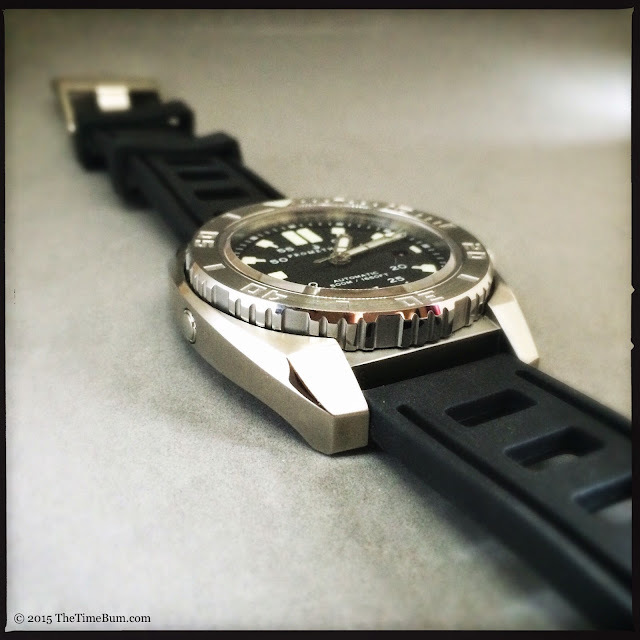 The watch is supplied with a 22mm polyurethane strap. The rectangular cut outs and angled tail recall Isofrane straps. A signed buckle completes the picture. It is perfectly practical, complements the angular case, and provides another link to its 1970s inspiration. That said, it is the first thing I would change. It's not that it doesn't look good, but I have no love for poly. I find it stiff and uncomfortable. Instead, I'd buy a similarly styled natural rubber strap. 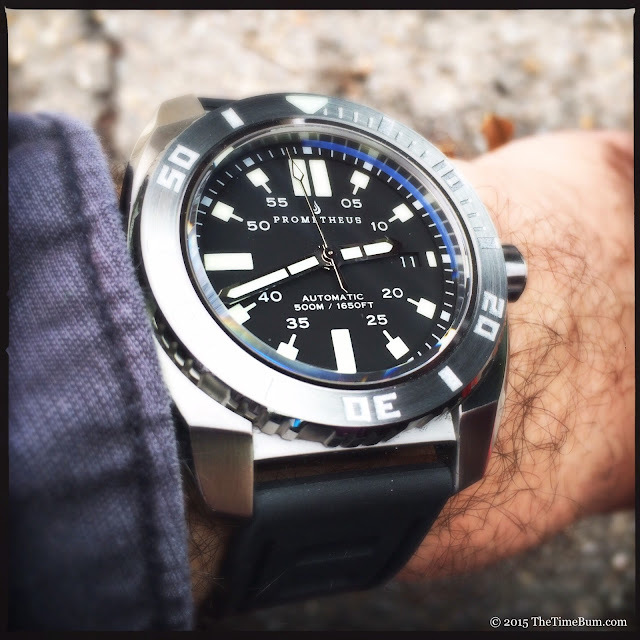 For several days, the Piranha was my go-to watch for weekend and evening activities. I found it easy to wear, even on my small 6.5" wrist. You will not mistake it for a svelte dress watch, but it is not at all unwieldy and man, does it look sweet: big, purposeful, and sleek. The Piranha's 339€ MSRP was already a great deal but has been made even better by the current 12 per cent sale and the strongest dollar we've seen in years. This means US buyers can get theirs for $322 USD, including FedEx International Priority shipping. 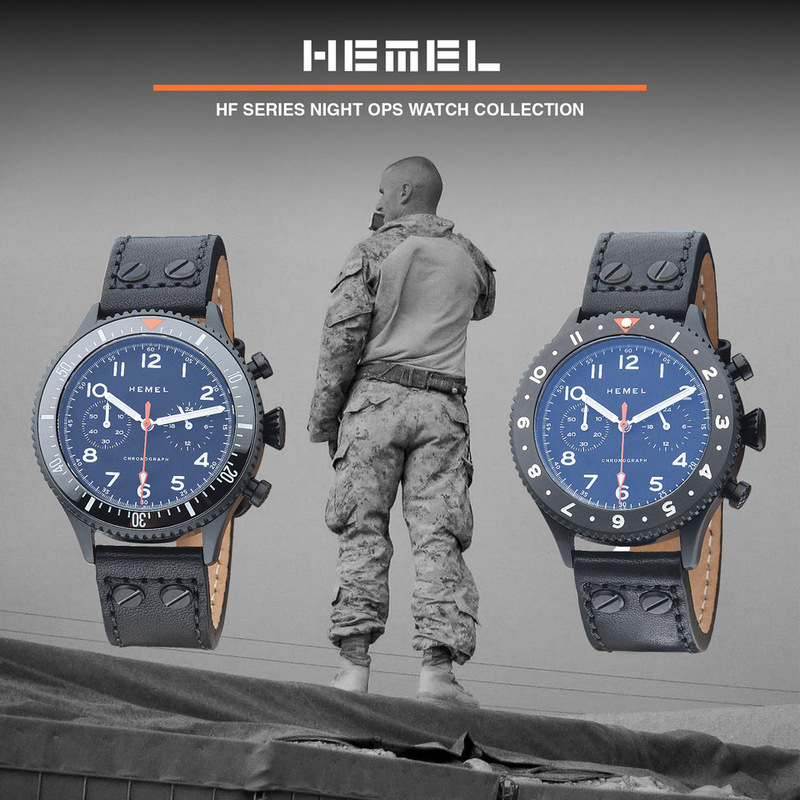 For a watch of this caliber, that's one heck of a bargain. Pro: Excellent case, 500 meter rating. Sum: High spec, sharp design, low price. The Time Bum approves.